Positive displacement blower discharge air temperature can exceed 200°F in some applications, especially when they are operating at high pressure and low rpm. 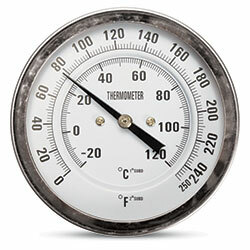 Use this gauge to monitor air temperature at your blower and throughout your system. Stainless steel case with glass lens is hermetically sealed to provide protection from weather and dust. Bimetal helix is coated with a viscous silicone to minimize pointer oscillation and improve temperature transmission. A slotted external adjustment screw is standard. Dual scale dial reads in 2 degree F increments and 1 degree C increments with ±1% accuracy.